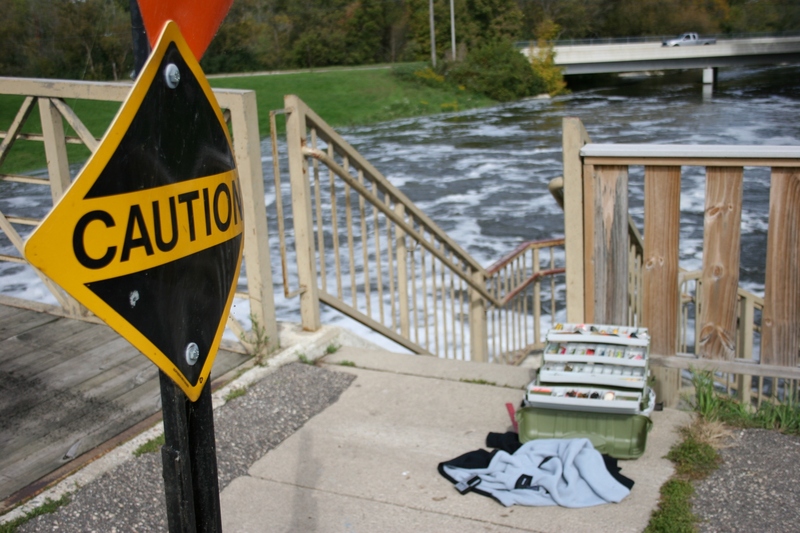 Fishermen angled for fish in the swollen Cannon River at the King Mill Dam in Faribault Saturday afternoon. BROTHERS DYLAN AND PARKER and their friend Doug are way braver than me. 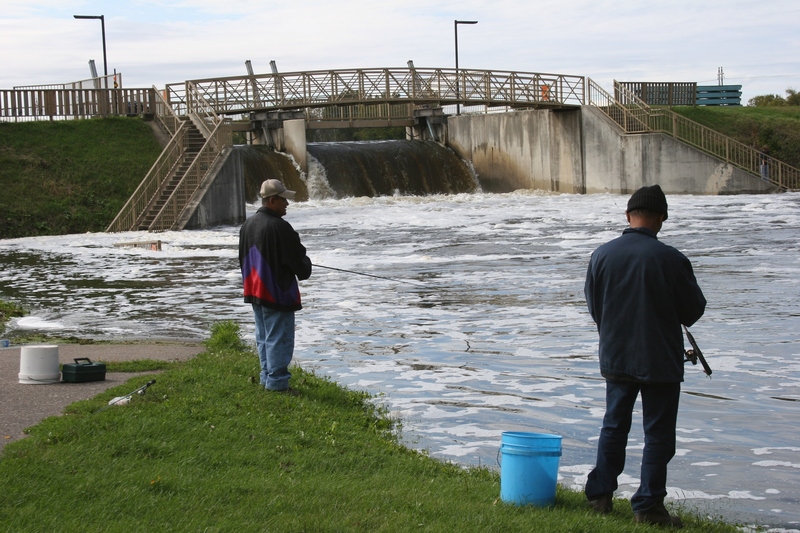 No way would you catch me angling for fish along the churning Cannon River at the King Mill Dam in Faribault today. Watching the water tumble and swirl, hearing the rushing roar, made me nervous. But seeing the boys standing so close to the dangerous river, tossing their lines into the mayhem as if they didn’t have a care in the world, caused me even more anxiety. 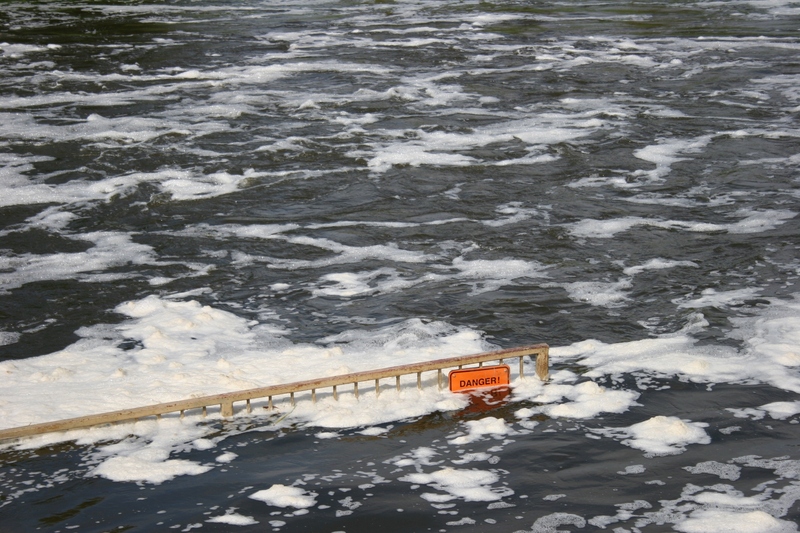 Only the top parts of a warning sign and of a sidewalk rail peeked above the high water at the dam site. I was concerned, enough to ask if their moms had given them any special instructions before they left home. “Watch the speed of the water,” said 14-year-old Dylan. “Don’t try and fall in,” Doug, also 14, added. Only the 11-year-old didn’t have anything to say. I suppose the boys thought they were cautious enough, and they really weren’t careless. But one slip on the steps where they fished, or one misstep from the bank, and they would be carried away by the swift-moving waters. 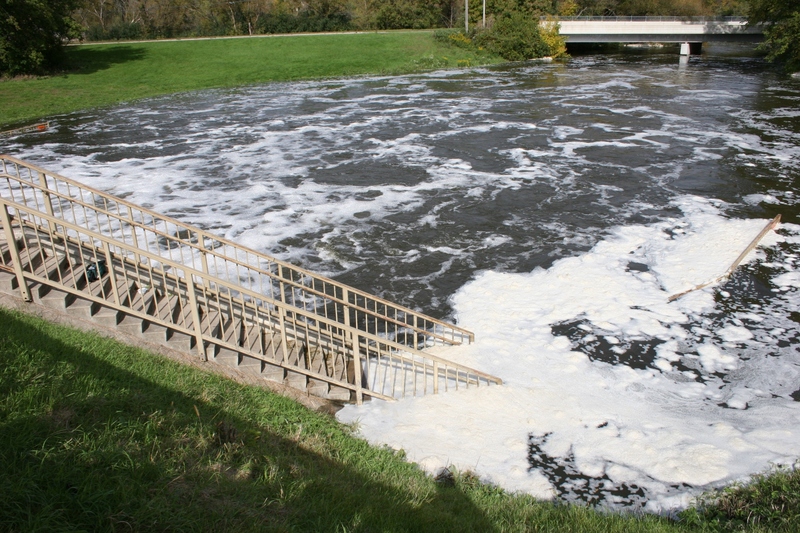 Part of the stairway and sidewalk were submerged in the Cannon River. The boys fished at the bottom of the stairs. 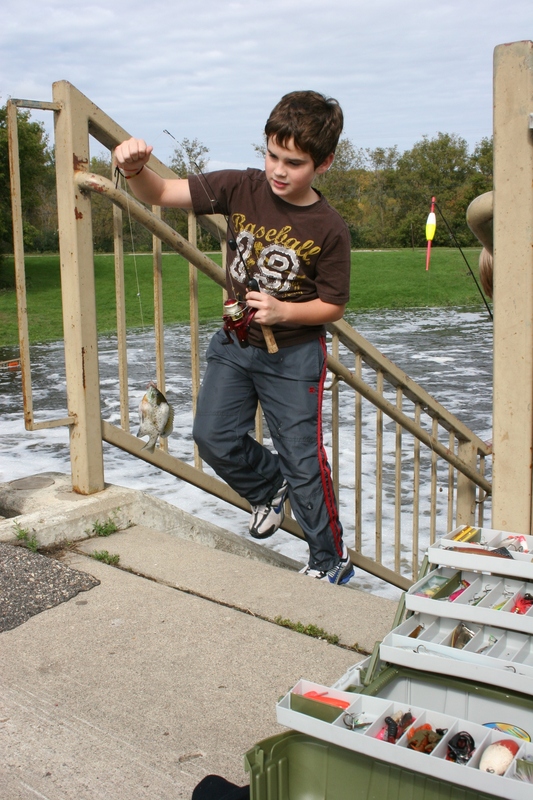 Parker climbed the stairs to the top of the dam with his catch, a sunfish. I tried not to dampen their spirits; they seemed so content—three boys fishing away a Saturday afternoon, reeling in bass and perch and sunfish. But I wanted them to know, in a subtle way, that I cared about their safety. A sign at the top of the dam walkway and stairs cautions anglers and others. 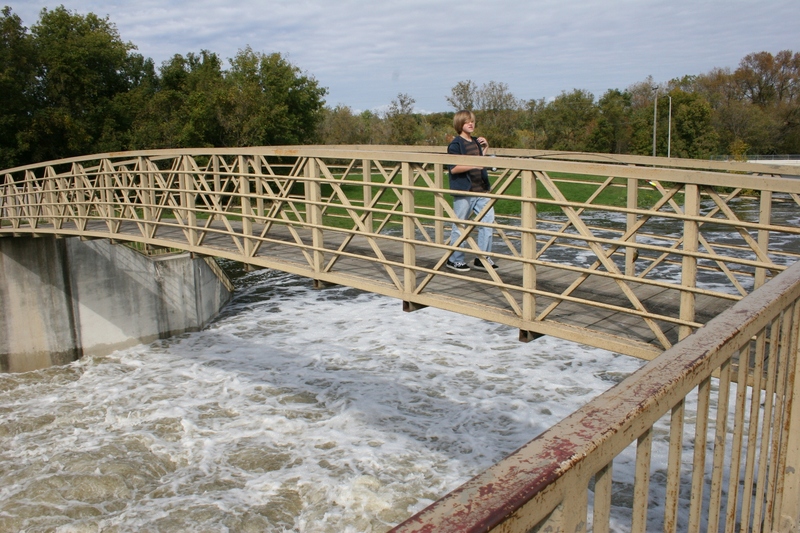 Doug crosses the bridge over the King Mill Dam as the river rages below. 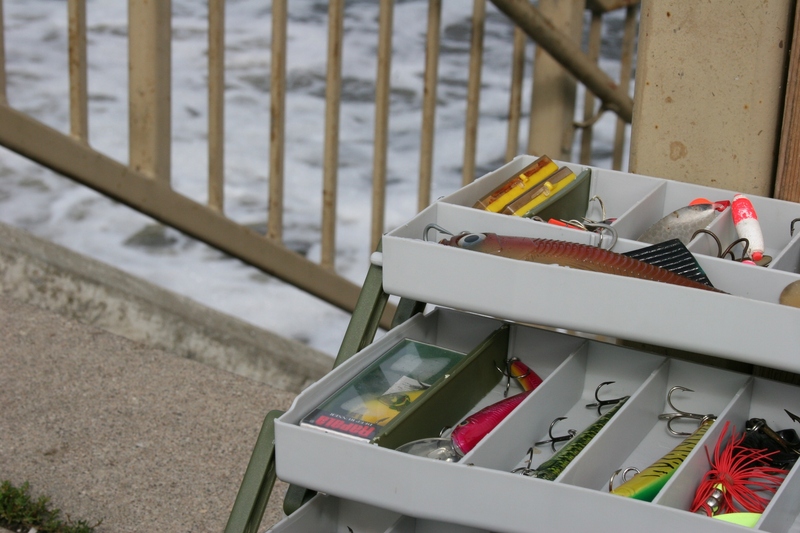 The boys set their tacklebox at the top of the stairs, which runs from the top of the dam to the lower river bank. 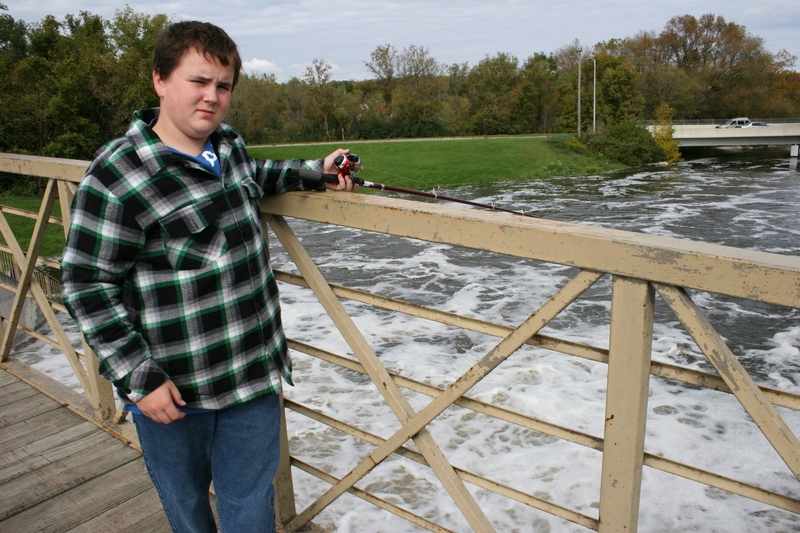 I didn't worry quite so much when Dylan fished from the footbridge across the top of the King Mill Dam.